The B75 Quantum rotor blades will be installed on the second prototype of Siemens' 6 MW offshore wind turbine, which will be erected in later this year in Denmark's Østerild Test Station. According to Siemens, the blade demonstrates “tremendous strength at low weight”, and, thanks to its specially-designed airfoils, can optimise performance at a wide range of wind speeds. The latest turbine from Siemens has a 6MW capacity, with a rotor diameter of 154 metres and a swept area of 18,600 square metres. 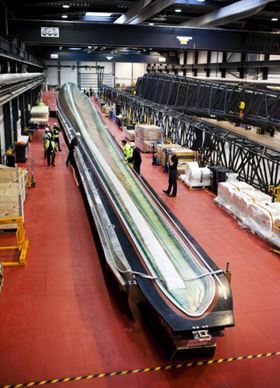 Siemens manufactures rotor blades in one piece without glue joints, using its patented IntegralBlade process. The company said that the process makes the blades more robust, which in turn significantly improves the cost efficiency of wind turbines. The launch of the new blade signifies a 200-fold growth in the energy capture area and the turbine capacity of Siemens’ turbine products over the last 30 years. 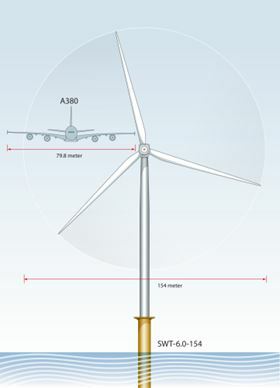 The company’s first commercial wind turbine had a capacity of 30 kW and 5 metre-long rotor blades, for a 10 metre rotor diameter, while the latest turbine has a 6MW capacity and 75 metre long rotor blades for a rotor diameter of 154 metres.